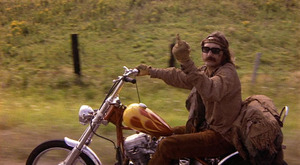 It’s been a tradition here on this Blog to post this great scene from the movie “Easy Rider” every 4th of July. For those too young to remember the movie, I highly suggest you look it up and watch it. Lots of stereotypes are profiled, but the show does a great job of capturing the late 1960’s. Shown in this scene are Jack Nicholson, Peter Fonda and Dennis Hopper. Ironically, Hopper (in the fringe jacket) was not at all like his Hippie-Biker character in the movie. He was the son of a U.S. Intelligence officer and supporter of right-wing causes, bragging about his 30-year track record of voting Republican. In this scene, Nicholson discusses the difference between individual freedom and a free individual. Sorry about the short commercial at the start of the clip, YouTube never used to have those. This entry was posted on July 5, 2018 at 1:47 am and is filed under News and Views. You can follow any responses to this entry through the RSS 2.0 feed.